A review of the effectiveness of the current system (an encore performance by Barb Poppe and Focus Strategies). The first report was delivered in December, and was the basis for Durkan and Constantine making an announcement of next steps in their effort to re-organize the homeless response for the region. This morning, the City Council was briefed on that report. The report provides ten recommendations on moving to a new regional governance structure. Several of the recommendations are only peripherally related to governance, though the consultant emphasizes that the ten are interconnected and reinforcing, not an a la carte menu of options that policymakers can choose to subset. The list is also neither sequential nor in order of importance. Adopt a system-wide theory of change. Consolidate into a joint entity. Expand health and behavioral health services. Increase the rate of housing development. Create institutional alignment with the parts of the response system that can’t be consolidated into a single regional organization. Adopt a system-side theory of change. Without agreement on a theory of change, the region has multiple governance bodies with different ideas of the results they are trying to achieve. The consultant even proposed one:If we create a homelessness response system that centers customer voice, then we will be able to focus on responding to needs and eliminating inequities, in order to end homelessness for all.They point out that embedded in the statement are suggestions for metrics to guide implementation and evaluation: centering the customer voice, responding to needs, eliminating inequities, and ending homelessness for all. Consolidate into a joint entity. 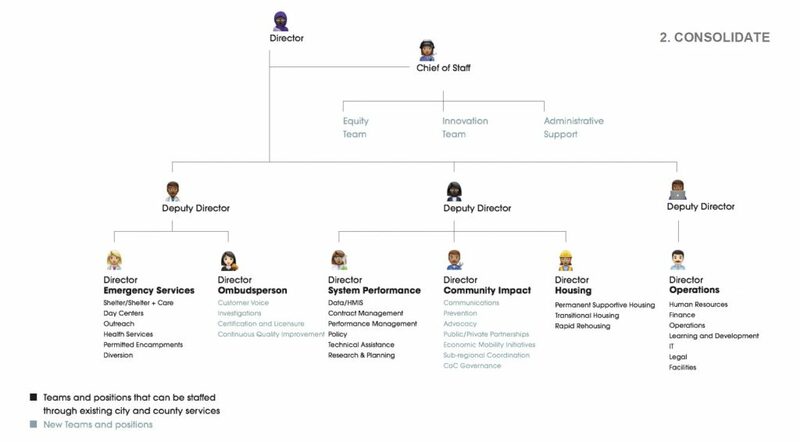 After inventorying all the public departments and agencies in Seattle and King County, they proposed an organization (though not necessarily with this specific org chart) with eight units: six functional ones, and two system-wide ones. Much attention was given to capital investments in affordable housing, and the importance of keeping those separate from housing services such as permanent supportive housing, transitional housing, and rapid rehousing. They recommended consolidating housing services, but leaving housing capital investments (i.e. All Home) outside the organization. That said, several stakeholders pointed out that the housing services programs can only be successful if actual housing is available, so there needs to be some ongoing connection between capital and service investments.They proposed four new units: An Ombud office, a COmmunity Impact office, an Equity team, and an Innovation team. The Ombud office is to make sure that homeless people in the system have a place to go to raise issues and complaints, because agencies and providers often have no incentive to address them and become impediments to ongoing improvement. In arguing for the importance of the ombud role, Future Labs spokesperson Marc Dones pointed out that the level of crisis is too high to have anyone declining to be inside because of concerns about the services being provided. Community Impact is a collection of activities that often fall to the margins of workers’ jobs, left to the end of the day or the weekends: communications, prevention, advocacy, etc. Separating them out ensures that the get the needed focus. Equity and Innovation cut across all functions and look for ways to address issues that more radically reshape the overall effort. Future Labs also proposed an oversight board for the regional authority, populated with elected and appointed officials in order to provide the accountability back to voters. Prioritize economic stability. They noted that the size of the homeless population is determined by the intake and “bounce back” rates, and that establishing economic stability for those about to enter the system or who are exiting it is critically important. As an example, they discussed the importance of establishing mechanisms for simple cash transfers, for the people who just need $200 to keep them out of homelessness (not $200 and a host of support services). Compared to the $20,000 it costs to move someone out of the homelessness system once they are in it, $200 is damn cheap. Dones pointed out that if you gave ten people at risk of becoming homeless $200 each, and only one of them managed to remain housed, you’re still way ahead in terms of cost-savings. Digital transformation. This comes in the form of better data sharing across agencies and providers, centered on a customer-controlled digital identity. Redesign intake. This involves making sure that people are asking the right questions at the right time. Ideally the regional system has a complete, detailed profile on each customer to the extent they want to make tha information available, but that doesn’t mean it will all be collected at the same time, or at the person’s first use of services. For example, if a person shows up somewhere to do laundry, a service provider shouldn’t be asking them about their childhood trauma or past drug use. Equally, the use of the digital ID shouldn’t become burdensome, As Alison Eisinger of the King County Coalition on Homelessness explained, someone shouldn’t have to show their ID in order to pee at a hygiene center (which apparently is happening sometimes now). Expand health and behavioral health services. This addresses the issues around mental health and substance abuse issues among the homeless population, but it also addresses the customers’ stated desire for emotional support. Establish a public/private partnership. Most importantly, this involves funding alignment, across the public sector, nonprofit providers, and philanthropic funders. Increase the rate of housing development. Dones suggested that there are difficult tensions between spending money to build out emergency services capacity, versus to build housing. Building a shelter, he said, is not necessarily a good use of capital funding, though that doesn’t mean that the region should slow down the opening of new shelters. Instead, it means that it should look to utilize existing spaces and establish temporary shelters. Establish institutional alignment with the parts that can’t be consolidated. Dones suggested that much of that alignment today is personality-driven and informal, but as such it fails when the people involved move on. He said that the region must structure permanent decision-making points, generally through MOUs. Council members noted that these recommendations, while (mostly) focused on governance, left some important topics untouched. Sawant pushed hard for Dones to acknowledge that the homelessness effort was substantially underfunded. For his part, Dones said that governance changes would create efficiencies but even with that the existing money was not enough. But he declined to go farther than that, arguing that a more detailed discussion of how much money was needed was really a conversation about how the money should be used, and he was not prepared to have that conversation. Sawant said that she appreciated the recommendations on governance, but worried that creating a regional governance body could become an excuse for elected officials to deflect accountability for the issue of homelessness. Mosqueda suggested that “an uncomfortable conversation” needed to be had about the Navigation Team’s role, and about funding sources. Deputy Mayor David Moseley fielded a question on next steps, saying that based on a session the Mayor’s Office organized two Saturdays ago, next steps are being worked up, and that Mayor Durkan is committed to getting both the functions and structure up and running as quickly as possible. That will require running the gauntlet of multiple local government authorities, as well as reshuffling of budgets, so don’t expect anything to happen overnight. But toward that end, the Mayor has hired Tess Colby as a Senior Advisor in her office to be the principal person on the effort to establish regional governance for homelessness. Longer term, the success may depend on how many other local governments join in. As Dones pointed out today, the problem is not limited to the borders of Seattle and King County.